The timeline below covers the major events in the history of the Court House – both the original building in the Market Place and the current building which replaced it. George, Duke of Clarence, held title to the site on behalf of his wife Isabella Neville. On his death in 1478 (drowned in a vat of Malmsey wine according to Shakespeare’s play Richard III) the site of the Court House passed back into the ownership of the Crown. The three shops that stood on the Court House site were then granted to a William Edmonds, a royal servant, the rent forming part of his remuneration. The shops were turned into an inn – the CrossTavern – in 1510 and subsequently granted to William Compton, of Compton Winyates, as part of his rewards as Keeper of the Castle. Records show that the property was passed to later Keepers of the Castle, Richard Cecil (1531) and Thomas Fisher (1545). Before the creation of the Corporation in Warwick, the Court Leet played a great part in the government of Warwick with officers like Constable, Overseer of Pavements, Ale, Fish and Flesh Taster, Bread Weigher and Brook Looker. A Court Leet was a Royal Franchise, but in the case of Warwick, as in many similar towns, it was granted to the feudal Lord who, in Warwick, lived in the Castle and was also Lord of the Manor. At the time of the Grant of the Charter of Queen Mary to Warwick in 1554, the Estates of the Earl of Warwick were in the hands of the Crown. This was due to the execution on Tower Hill in 1553 of John Dudley for his complicity in the plot to place Lady Jane Grey upon the Throne. This event overshadowed the boyhood of his son, Robert Dudley, 1st Earl of Leicester, but who became, reputedly, the suitor for many years of Queen Elizabeth I. In order to strengthen the powers of the Corporation, the Lordship of the Leet was granted to the Corporation by that Charter. This effectively gave the Mayor the appointment of High Bailiff and the Town Clerk the Stewardship. Queen Mary, who earned the nickname of ‘Bloody Mary’ due to the way she dealt with religious dissenters, was the daughter of Henry VIII and Catherine of Aragon. She reigned from 1553 to 1558. The town of Warwick owes much to both Thomas Oken and Nicholas Eyffler. A charity in the names of these two 16th century benefactors still provides almshouses in the town. Economic astuteness earned a comfortable fortune for the merchant Thomas Oken – a member of the Corporation until his death in 1573 – and warranted for German-born glazier Nicholas Eyffler the patronage of Sir Thomas Lucy of Charlecote Park and the Earl of Leicester of Kenilworth Castle. Their financial success was matched by their benevolent endowment to the people of Warwick through their estates. The heavy chest now standing in the corner of the Council Chamber at the Court House is the one restored and painted with the town’s arms and Thomas Oken’s initials in 1851. In actual fact, this particular chest was probably made in 1593 for Thomas Eyffler, but is similar in all respects to the chest referred to in early records as belonging to his fellow Warwick benefactor. The five plate locks and hasps and staples for four padlocks ensured that only in the presence of all keyholders – members of the Corporation – could the chest be opened to allow access to the money and confidential documents secured within it. Whilst Council meetings had been held in St Mary’s Church where the chest containing important papers and money was kept, contemporary records show that the ‘Court House by the cross, now their common hall’ seems to have become the normal meeting place. In 1613 the Council agreed to hold their weekly Wednesday meetings at the ‘parlour by the Cross’ and in 1628 paid for a pair of stairs to make access easier to the upper rooms. In 1632 they had a survey of the rooms ‘above this place’ to see how they could be made fit to sit in and make a place to keep the records and writings. On 5th September 1694, after a hot, dry summer, it is thought that a stray spark set light to a thatched roof in the town. Strong winds caused the fire to spread rapidly amongst the timber framed houses. 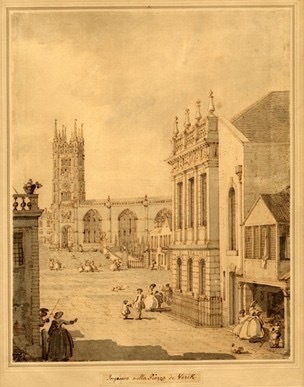 The Great Fire of Warwick – one of the most noteworthy of urban fires – destroyed most of both sides of High Street and a large swathe of property along Swan Street and Church Street and into Market Place. The flames did not succeed in crossing the top of Castle Street, though they did cross Church Street, destroying houses on both sides, the chancel of the church and about half the length of the north side of Jury Street until halted by a stone building. The Corporation found itself surrounded on three sides by rubble and ashes, with its own building somewhat singed. The damage was estimated at £15 on a first claim, but later amended to £5. Compensation of 12s 6d [about 65p] was actually received. The rebuilding of Warwick after the Great Fire did not involve the Corporation as a body, as influential commissioners were appointed to oversee the work. However, commissioners included the Town Clerk who was from ‘a County family’. Lord Brooke, whose principal residence was in the town, was also a commissioner and he influenced re-modeling of the town as a ‘fashionable antechamber’ for the castle. The creation of a new square had been suggested before the fire, so the destruction of property in that area enabled this to be carried out, together with widening and straightening Northgate Street, Church Street, High Street, Jury Street and Swan Street. The south side of Jury Street, unaffected by the fire, retains the slight curve that had accommodated medieval markets. A major expenditure of the Corporation in the years immediately following the fire was the purchase of the former college building and its adaptation to be used to house the Free School. However, the Corporation was clearly soon considering a new building that would enhance the town – and their own status. In 1708 the property immediately behind the Court House was acquired; it had already been decided to negotiate for the neighbouring property belonging to Robert Ashby, although this did not proceed at the time. With acquisitions of adjoining houses in Jury Street and Castle Street in the early 1720s, the Corporation finally agreed, after much dispute, to rebuild what opposition to the idea described as a ‘good old strong building’. Entrusted with the construction work was Francis Smith, who had gained a strong reputation for quality and honesty through his contribution to the repair of buildings destroyed in Warwick’s Great Fire. Some of the masonry and the floors were the work of Francis Smith’s brother William, and brick and tiles were supplied by Nicholas Rothwell. Master craftsmen Thomas and Nicholas Paris fabricated the ironwork. Their father, also Nicholas, was one of the finest and most versatile metalworking craftsmen of the 17th century, making guns, clocks, wrought-iron gates and screens. During the building work, the corporation moved its business activities to a room in Eyffler’s House. The Corporation must have been using some of the partly completed building during 1727 and 1728, as records show a delivery of coal and beer. The final touch in 1731 was the carving of the Royal and Corporation Arms above the door by Thomas Staynor, at a cost of £15. The building cost of £2,254 involved the Corporation in considerable debt, with claims that the Corporation had exceeded its powers. The outcome was the legal separation of the endowed trust from the Corporation known from that point on as King Henry VIII Charity. However, the building itself would immediately have become the centre of fashionable life. It is easy, even as the building is now, to picture scenes of civic and social importance played out amongst its corridors, meeting rooms and on the wide staircase leading up to the ballroom. The heavy chest now standing in the corner of the Council Chamber at the Court House is the one restored and painted with the town’s arms and Thomas Oken’s initials in 1851. 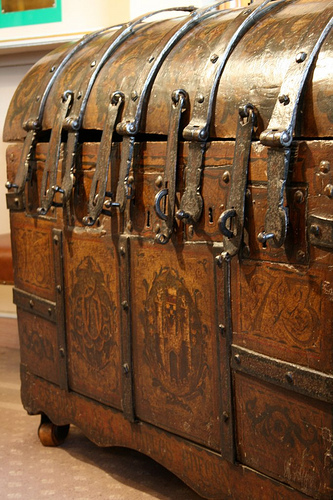 In actual fact, this particular chest was probably made in 1593 for Nicholas Eyffler, but is similar in all respects to the chest referred to in early records as belonging to his fellow Warwick benefactor. The five plate locks and hasps and staples for four padlocks ensured that only in the presence of all keyholders – members of the Corporation – could the chest be opened to allow access to the money and confidential documents secured within it. See the Oken’s Chest website. On Jury Street, to the north of Court House, lived Thomas Greenway, an influential lawyer who dealt with many of the affairs of the Earl of Warwick, and was associated with banking, the canal company, the Turnpike and charities. After the death of Thomas in 1804, his son, land agent Kelynge Greenway, and subsequently a great nephew, also Kelynge, continued to add to the family estate based on Pageant House, acquiring properties and land in Castle Street. The house in Castle Street directly behind the Court House was empty, derelict and evidently about to be removed to create a garden, leaving an untidy rear wall of the Court House. After lengthy discussions with King Henry VIII Charity over assistance with the costs of repair work, a negotiated scheme was drawn up by local builder, Charles Bullock. In return for the council removing the outbuildings at the rear, Greenway would transfer some of his land to them. All of the land behind the Court House belonged to Greenway, so the outlook of the new rear windows would be over the newly formed garden. Magistrates pressed for improvements to the courts to form part of the work. The original court probably ended at the wall that supported the long wall of the assembly room, with a fireplace using the chimney stack above. A stated requirement was for strong closets for the storage of the muniments of the Council and of Henry VIII Charity. Part of the additional space created behind the court in 1857-8 was occupied by the passage that allowed the Greenways to access their conservatory against the back wall of the Court House. The scar from the conservatory roof is visible in the brickwork today. The central gable over the Court House frames the arms of the Borough flanked by the Greenway arms. Warwick Pageant – performed in the grounds of Warwick Castle in July 1906 – presented a history of Warwick in twelve episodes. Louis N Parker, born in France of American parents, masterminded the event that took thirteen months to prepare with a cast of 2000. Parker had scored a triumph the year before with a pageant at Sherborne, Dorset and subsequently continued as impressario for similar events in Bury St Edmunds, Dover, Colchester and York. It’s said that ‘pageantitis’ swept Britain about this time, when British history was only a few years away from a devastating new chapter. Meeting rooms, workshops and rehearsal space for the Warwick Pageant were made available to the Pageant Committee in the property and gardens adjacent to the Court House by owner Edward Montague Nelson. In fact, this is how and why the property became known as Pageant House and Gardens. The Corporation had turned down Nelson’s offer to sell the property to the town in 1905, but after the 1906 Pageant, the Pageant Committee reviewed the offer. After much deliberation, they used profits from the Pageant event to purchase the house and grounds and the purchase was completed in April 1908. The gardens were opened to the public in July 1908. In 1919 the accommodation at the Court House was considered unsatisfactory, with poor ventilation and complaints about the noise of passing trams*. Fixtures and fittings were out of date and counsel, solicitors and witnesses were accommodated together indiscriminately. In short the Justices didn’t meet oblivations under the Municipal Corporation Act to provide suitable accommodation for justices and their officials. Originally talked about in 1914, these plans were of course forestalled by the outbreak of the First World War, when the Court House and Pageant House were taken over as an army pay office. After the war – in fact not until 1922 – work was carried out, but on a lesser scale, because of post-war financial restrictions. After WWII an air raid shelter built against the Castle Street wall was remodelled as a park shelter and eventually demolished in 2003. In 1948, work was carried out to allow the magistrates direct access to the Members’ Retiring Room, the former Pageant House dining room. This was achieved by a door connecting Pageant House and the Court House via an unexplained existing corridor within a wall. This corridor may once have been the location of back stairs leading to the Assembly Room, or simply a way of bringing prisoners into the Court Room. Other plans for restoration were made in 1949, but not carried out until the mid-50’s. Windows overlooking Castle Street had been blocked: it’s believed this happened in the 19th century to create wall space for works of art internally. When the work of opening them up was carried out, a bust of Queen Victoria was relegated to the cellars. The bust, valued in 1916 at £200, was the work of sculptor and Royal Navy officer Count Gleichen, the son of Princess Feodora of Leningen, a half sister to Queen Victoria. The bust was, according to records, offered to the County Museum but its present location is unknown. The plans made in 1949 also proposed updating the placement of radiators in the ballroom, some of which were located within the fireplaces: the work was actually done in 1954. However, the later photograph still shows a large number of radiators against most parts of the walls. Warwick town had its own magistracy from the 16th century. In 1953, the Borough Sessions were amalgamated with the County Petty Sessions, all held in the Court Room. The Magistrates’ Bench was originally set against the windows. With the removal of a partition wall – the fireplace and wall of the Assembly room above now supported by a huge beam – the Magistrates’ Bench was re-positioned against the east wall between the two doors. The Court Room became redundant and virtually unused when the Magistrates’ Courts were brought together in a new building in Leamington Spa. With the subsequent local government reorganisation taking effect in 1974, a partition wall was rebuilt where one had previously been removed and the Town Council Chamber took shape in its current form. In the Chamber are portraits of Henry VIII, who granted Warwick its Charter, presented to the Corporation by John Bohun Smyth – mayor between 1811 and 1819 – and of Francis Smith – builder of the Court House – given to the town by its MP Edward Greaves in 1855. There is also a portrait, of unknown provenance, of Charles II, who granted the third Charter to Warwick. With its central town location on the pedestrian route from the Castle to St Mary’s Church, the Court House is ideally situated for visitors exploring the town. A small office was established in 1975 in offices behind the Council Chamber, and in 1994 the Tourist Information Centre moved to the larger space of the room to the right just inside the front door on Jury Street. The former Mayor’s Parlour is a large panelled room and contains a massive oak chimneypiece, the work of the master carver Thomas Henry Kendall (1837-1919) of the Warwick school of woodcarvers. Kendall’s work, besides the carved portal at 15 High Street, Warwick (1892), interestingly includes the lectern at the Marble Church of St Margaret, Bodelwyddan in the form of an eagle standing on a rock. It is said to have taken Kendall 6,000 hours to complete the lectern, at a cost of £600, and is carved from a single oak tree stump. Other work includes carving at Sandringham House in Norfolk and 32 panels for the Dining Room at the House of Commons. By 2009 the building was in need of significant repairs, together with alterations to improve accessibility. The refurbishment project saw the building reopen in 2014 as a cultural centre for the Town.